June Cleaver's house is immaculate and yet she always has time to bake cookies for the boys for after school snacks. But, did you know that the Cleavers have a maid? Having a maid would free up a lot of us moms to bake homemade cookies and would certainly improve the state of our homes (mine especially). What about the pearl necklaces and the high heels? According to and article in The Washington Post, Barbara Billingsley had a "hollow" in her neck and wore the pearls to cover it up. As for the high heels, The Washington Post quotes Barbara Billingsley as saying: "Wally and the Beaver began to get taller. That's why they put me in heels. The producers wanted me to be as tall or taller than the kids." 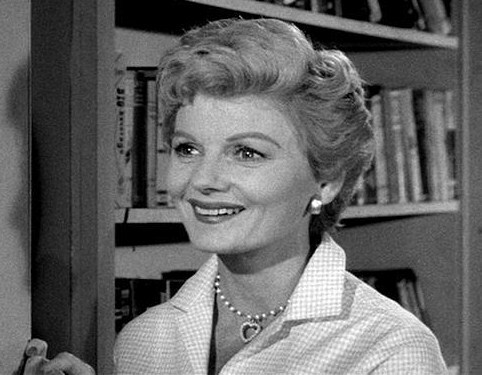 What society has interpreted as "perfection" in the character of June Cleaver was actually insecurities and shortcomings (pun intended). In the episode, "Brotherly Love" from Season 1, June even questions herself as a mother. June attempts to get the boys to stop fighting with one another, but after a short break they inevitably start fighting again. June and Ward hear the fight from downstairs. June: "Oh Ward, I just failed as a parent." Ward: "From the sound of things, I'd say they were succeeding as children." We moms need to stop comparing ourselves to the idea of "the perfect mom" -- whether that mom is a character on a tv show or a mom in real life. No mom is perfect. Feeling sub standard is not going to help us be better moms and pretending to be perfect will only make others (including our kids) feel they can't measure up to us. So... kick off the high heels and set the pearls and the mop aside. This Mother's Day don't worry about how you 'measure up' as a mom -- just take time to enjoy your kids (and maybe some store-bought cookies). Wonderful post! I will never say I am no June Cleaver again! I completely agree with this post! It's very refreshing!!! Oh, How I enjoyed reading this!! It put a smile to my day! :) I hope you had a great Mothers' Day! Elizabeth, you and me both! I tend to be more of a spot cleaner (when necessary). Except, yes, my mom would have baked the cookies.